In a long text document I have a number of different image types I wish to caption. Figure 2. Alice went down. Chart 2. Characters in Alice. Map 1. Holy Roman Empire. Map 2. The rabbit hole. Question 1.) I am trying to create named text styles for these: Font, size, style, automatic numbers (presumably based on whether I name my style Figure Title, Chart Title, Map Title), etc. How do I get the word "Figure" or "Chart" or "Map" to appear before the automatic number? It seems no matter what I do, the sequence is: 1. Figure. ; 1. Chart. ; etc.. I do not see where or how to add an automatic field with the necessary label before an auto number, then to be followed by individual identifying text in each caption title, terminated by a period. Map 2. The rabbit hole. Map and cross-section showing the various locations Alice entered, including citations for actual chapters in Carroll's book. Question 2.) If I am able to create these styles, then what is the procedure to create a "List of Figures", "List of Charts", "List of Maps" — with page numbers — (in addition to my TOC created by Heading styles) at the beginning of my long document? I would presume this might be in the TOC creation panel, based on searching for the 3 text styles I created when adding the image titles. The longer explanatory text, being in a different style (Caption Body), should not appear in these lists of image titles. I have not found this addressed in the manual. I think my answer is already in there, but I do not see where/how. I need help with some sort of step-by-step process; I am clearly missing something. Thanks for this very interesting program. I really doubt that it is going to be possible now or in the future. This is best done outside of the Layout program Generate the text using a script and then import into the Publisher file. Or just generate the text by hand in a text program if it is just a few titles and captions. You should be able to place the caret at the start of the list's Text field and type there. Either click with the mouse, or use the cursor keys to move the caret back and forth, like a normal text entry field. I would usually be adding longer explanatory text after the period, but in a different style such as Caption Body. You can apply a different character style to it manually. You might be able to base the list style on Caption Body and then use Initial Words to get the short identifying text formatted differently, or you might not. I'm not sure if it is flexible enough for you. You can have a separate Table of Contents for each list, but there's currently no way to automatically exclude the Caption Body text from it. It will always include the whole paragraph. You can delete the unwanted text manually, but you'll have to do that again whenever the TOC is regenerated. 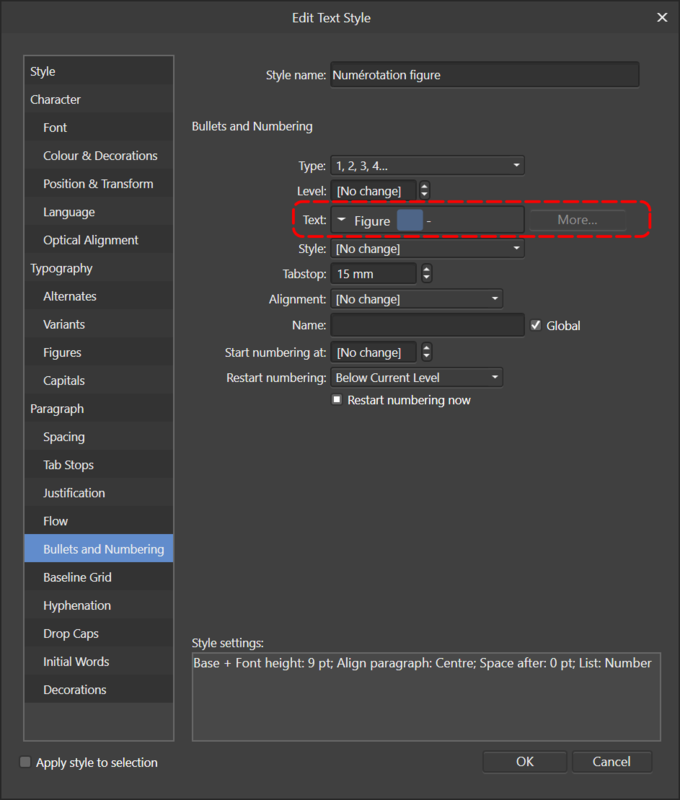 Here is my setting which work well as you want for numbering figure. The blue square (and I thinkl it's a bug) is for \# corresponding to current level. If you have several figures on a same page you should put the last one on top of layers panel and the first one on bottom.